Before we begin, let’s make one thing clear: everyone needs salt to survive! Salt is a critical element of our anatomical functioning, essential for regulating blood pressure and volume, and for maintaining proper muscle and nerve function. Without salt, we’d very literally expire! But the problem is that we’re getting too much of the wrong kind of salt. I’m talking about the kind that makes those potato chips oh-so-delicious, that has you coming back for more french fries, that keeps you choosing the salted peanuts over the unsalted ones. It’s the sodium in processed foods that killing us, along with the salt we find on restaurant tables or even at the dinner table of the unlearned among us. If you’re adding a sprinkle of unprocessed Himalayan pink salt or unrefined sea salt to your meals, chances are you don’t need to worry about your daily sodium intake. When natural salts make it to your plate unprocessed, they retain all of the trace minerals and essential nutrients that allow your body to process them efficiently and send them to where they’re needed most. The list goes on, but you get the idea: craving less processed salt is definitely good for your health. And I have just the thing. A recent study published in the Journal of Hypertension discovered something very curious indeed: spicy foods are able to curb salt cravings. As part of the study, over 600 adults were asked to perform a taste test using solutions containing either salt or capsaicin, the active compound in peppers that gives them their characteristic spicy kick. Along with asking the participants to complete a questionnaire regarding how often they ate salty and spicy foods, researchers were then able to chart their sensitivity to and preference for each of the two food types. Their findings showed that those people who ate more spicy foods had significantly less salt intake in their diet — an average of 2.5 grams less per day. Those people who ate spicy foods the most also had lower blood pressure readings than those who ate spicy foods the least — perhaps not surprising, given the aforementioned link between salt intake and hypertension. And when the research team dived deeper, they found out why: imaging scans of the participants showed that spicy foods and salty foods activate the exact same region of the brain, with spicy foods thereby “tricking” the brain into thinking it was eating something salty. This explained why those people who ate more spicy food were less inclined to want salty foods. So, could the solution to your salt cravings simply be to eat more food laced with hot peppers? Quite possibly! Try playing around with adding fresh chilis to the meals you cook at home, and consider carrying a little jar of ground cayenne pepper to sprinkle on your meals when you’re out and about. Supplementing with capsaicin, however, likely isn’t going to work — it’s the taste receptors in your mouth that trigger the salty response in your brain! 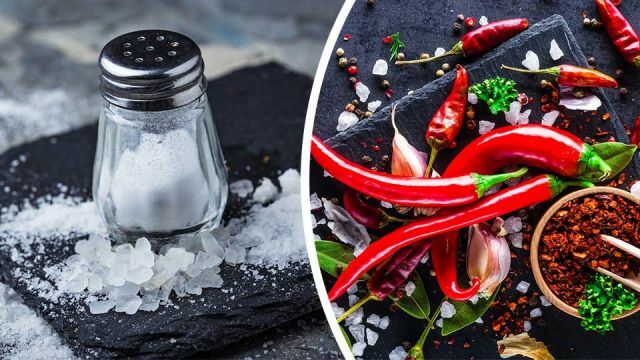 Beyond adding more spicy food to your diet, however, there’s an even bigger change you can make to improve your health: ditch the processed salt and invest in some high-quality unrefined salt! The aim of the game here is to only use salt that hasn’t been processed in any way -—other than either digging it out of the ground or drying it from sea water, of course. Two salts that definitely fit this bill are Himalayan pink salt and Celtic grey salt. Himalayan pink salt is sourced from the ancient, evaporated sea beds in the foothills of the Himalayan mountains, and is valued for its ultra-high trace mineral content. There’s also the added bonus of the salt already being dried out and ready to use — no evaporative processing required! Whenever possible, try to buy sustainably-sourced Himalayan pink salt, as some products are mined in environmentally damaging ways. Celtic grey salt is quickly becoming a new favorite of mine, on account of its tantalizing variability (because it’s unprocessed it can come in a wide range of colors, sometimes with tasty little flecks of kelp) and delicious flavor. Finding good quality Celtic sea salt is fairly easy — the less homogenous it looks, the less processed it probably is! The beauty of unrefined salts is that our bodies know what to do with them — they process them efficiently, utilize them where they’re needed, and excrete them in our urine if we eat too much. What’s more, they taste so much better than table salt — so there’re really no excuse! Hey Buddy!, I found this information for you: "If You’re Craving Too Much Salt In Your Diet, Eat THESE Every Day". Here is the website link: https://www.thealternativedaily.com/spicy-foods-can-help-with-salt-cravings/. Thank you.